"You're 35 years old, Mr. Vale. Why are you such a derilect; such a piece of human junk? The answer is simple: you are a scanner, but you don't realize it. It has been the source of all your agony, and I will show you how it can be a source of great power." Scanners is probably one of the most infamous sci-fi/horror films of the early 1980s. Even today, I still hear pop-culture references to it, whether on television or from the people around me. Yet, it strikes me that Scanners is remembered for all the wrong reasons, as some kind of super-violent celebration of gore. This is simply not the case. As anyone who's actually seen the film can attest, it's more of a serious attempt to take a bizarre concept and turn it into a very thought-provoking and heavily detailed story. In many ways, it's extremely revolutionary, and certainly provides one more example of David Cronenberg's expert ability to turn twisted and strange ideas into incredibly well-developed cinema. Scanners is set in a not-too-distant future, in a society where advanced telepaths ("scanners") walk among us. Scanners have the ability to seek through other people's minds and, if they wish, do them serious harm. Most of them, however, are on the lowest rung of social existence. One of them is Cameron Vale (Stephen Lack), who is quickly captured and imprisoned within a mysterious security company. He falls under the care of Doctor Paul Ruth (Patrick McGoohan), who tries to teach Vale about his gifts and how to control them. In the process of clearing his mind and perfecting his telepathy, Vale is told about Darryl Revok (Michael Ironside), a sinister, power-hungry scanner that is working against those that want to make scanners useful members of society. Vale learns is he one of the last scanners that is not working for Revok and his underground, and so he is sent on a mission to find Revok and eliminate him. This is easier said than done, however, since Revok knows much of what Vale is up to thanks to a traitor within Ruth's own organization. Though Scanners is often associated with extremes of violence, namely exploding heads, it actually forms a small percentage of the film. Those hoping to see lots of blood and guts are going to be disappointed because the reputation of Scanners is really exaggerated. In fact, there's only one exploding head in the whole film. Instead, its more of a hard sci-fi story told in a very interesting way. It manages to keep intensity and atmosphere, which seems to be a Cronenberg staple. He always keeps his films very serious and, thanks to his skill, this never comes off as laughable, because he knows the limitations of the story. Mixed in are elements of early cyberpunk, which certainly puts Scanners in a unique place in history. Considering the during the early 1980s so many awful and poorly made horror films were produced, the quality here is enduring. Although lead actor Stephen Lack is a little on the dull side, the cast is nicely rounded out with faces like Michael Ironside and Patrick McGoohan. Robert Silverman (who has appeared in 5 of Cronenberg's films) also makes an appearance as the strange artist Benjamin Pierce. The writing is extremely strong, with twists revealed as the plot moves along. I think it's safe to assume that Cronenberg was at least partially inspired by elements of the classic, surrealistic, William S. Burroughs novel The Naked Lunch, in which the central character, William Lee, sometimes thinks he's being watched and tracked by mysterious "senders," that use telepathy to kill and aim to take over the governments of Earth by grouping together in underground organizations. This wouldn't surprise me given his obsession with Burroughs, whom he later worked with on the film The Naked Lunch. Another overlooked element is the unique sound design. Not only is Howard Shore's musical score effective and properly somber, but there is heavy reliance on strange sound effects and filters. This is all done tastefully, and helps to add further intensity to the already creepy atmosphere. All of this combines into one of the true high points of sci-fi/horror filmmaking, and certainly a noteworthy point in director David Cronenberg's career of unconventional ideas. Image Transfer Review: The anamorphic widescreen transfer is very nice, and certainly better than any previous incarnation I've seen. Colors are bright and scenes are nicely detailed with great black level. There is some grain and softness to the print, but it's fairly minimal. Speckles appear here and there, but in general, there is no damage that affects the film. Some slight pixelation and haziness occurs in a few portions (usually with really bland background colors), but it's brief. The film could really use a total reworking or remaster, but as it stands, this is a satisfying image. Extras Review: Cronenberg's movies thus far on DVD haven't really been very impressive�downright depressing actually�with the exception of Criterion's superb Dead Ringers. Well, MGM gets no points for this pathetic presentation of a major cult-classic. Other than an original, full-frame trailer and subtitles, there is nothing else worth mentioning. It has fairly lame presentation, no insert, and about the only positive thing I can really say is that at least MGM made no significant changes to the original cover art. 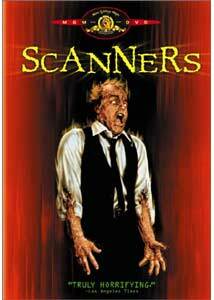 As a major David Cronenberg fan, I'd buy Scanners despite the complete lack of supplements. However, some fans may not be as tolerant. It's a shame MGM dropped the ball on a potentially stellar special edition for arguably one of the most innovative and solid horror films of the early 1980s. If you've never seen it, give it a shot on rental.